We are thrilled to have established a school garden and outdoor classroom, called the NKE Arboretum, at Netherwood Knoll Elementary. What was once an overgrown and little-used courtyard inside our school is now a captivating natural area that draws people of all ages and facilitates learning. 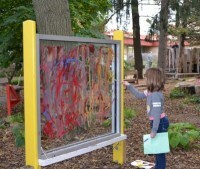 With the renovation of the space, our outdoor classroom now has art gardens, a stream/pond area with waterfalls, a climbing structure that inspires imagination, many raised vegetable beds, a sand area, a dirt digging area and a geology labyrinth/exploration area, among many other intriguing features. An unexpected aspect of this project has been the way it has formed new connections between our school and our community. School families donate their time to help with Arboretum projects on weekends. High school students from the agriculture program helped clear the space, while students learning woodworking, built our nature art tables and created the signs that designate the areas. 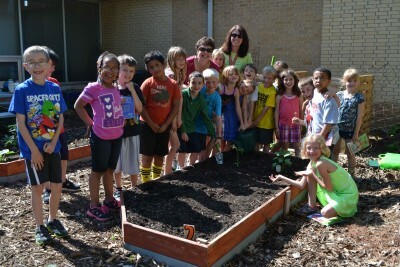 Local garden club members have donated plants and helped plant them. Local organizations such as the Rotary Club and the VFW have supported our efforts as well. With this project as the genesis, we have also begun forming connections with the other schools in the district to begin coordinating a district-wide vision for environmental education in our school district.